This club crawl takes you to four party venues in one night all for $25! Join 50 to 100+ other locals, tourists, singles, birthday groups for a fun-filled, stress free night. 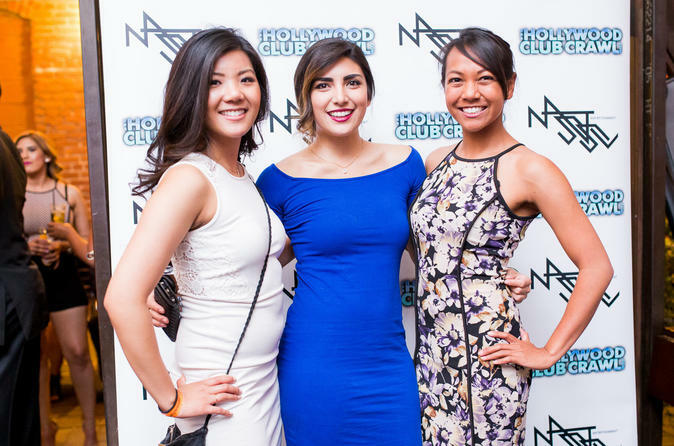 Let our VIP hosts walk you from club to club with no cover charges and no waiting in lines. You are guaranteed to meet a mass of new people. We are the longest running and highest rated Club Crawl in Hollywood since 2009. If you have ever done a night out on Hollywood boulevard, you know it can be challenging. Expensive cover charges, long lines, and new night clubs closing and opening every month. These are some of the big reasons we started this Club Crawl. We wanted to run an event that took the Hollywood hassle out of having a great night. Joining the Hollywood Club Crawl, our hosts will take care of everything for a legendary night out. We take you to the top clubs and walk you in with no lines and no cover charges. Your only responsibility is to have a great time. With an average group size of 50 to 100+ guests, it is easy to meet and make new friends that we hope you keep long after the last call. Whether you are a visiting tourist, an experienced local, coming as a big group or by yourself, everyone is welcome and we promise a fun, hassle free VIP evening with our groups and hosts.